In computer software, semantic versioning (or something like it) is something of a standard for how to version software releases. The Major.Minor.Patch semantics make clear how big of a change has occurred between the present and an earlier release. Is there something similar for versionining a dataset? Unlike with software, any change to a dataset might be a "major" change, so I'm not sure that the logic translates directly. Is there any commonly used specification for versioning a dataset? I wonder if the dat folks have thought about this http://dat-data.com/ max ogden & co. - I don't know, but i imagine they'd have some insight here. 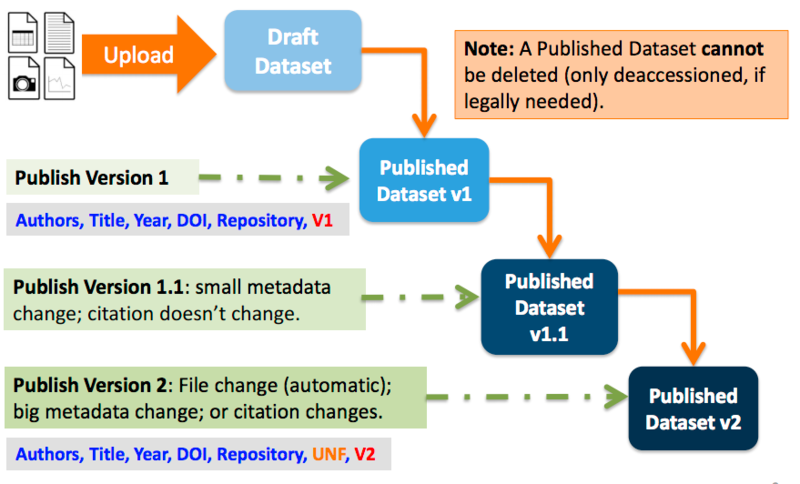 The Digital Curation Centre guide on how to cite datasets and link to publications gives a good summary to the various approaches to dataset versioning from the viewpoint of repository managers, and links to further information. Please provide a précis of the content you linked in this post, as links may change and web resources become inaccessible over time. How can I generate DDI metadata for a dataset?